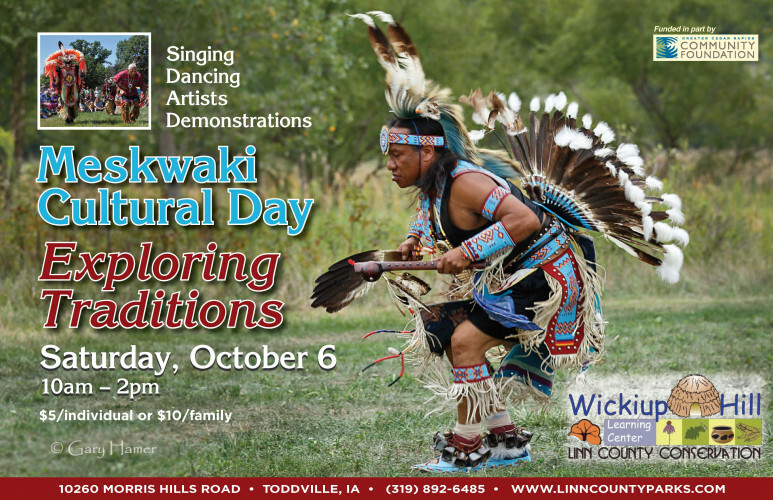 Meskwaki Drums, Singers, Dancers, Artists, Hands-on Demonstrations. Tickets must be purchased at the gate: $5/individual or $10/family (tickets are not available online). Educators from the Office of the State Archaeologist will also host an information booth with exhibits and traditional toys and games. Learn more about Wickiup Hill on Facebook! Wickiup Hill Learning Center is located just NW of the Cedar Rapids metropolitan area near Toddville. I-380 north to Blairs Ferry Road NE; west on Blairs Ferry to Feather Ridge Road; right (north) on Feather Ridge to Morris Hills Road; left (west) on Morris Hills Road - follow to the end of the road, the Center will be on your right (north).